The Cincinnati Bearcats take their last trip to Freedom Hall Sunday at noon to take on the Louisville Cardinals. The Bearcats have played the most games of any Louisville opponent at Freedom Hall, 41, and have won the most, 14. The Bearcats also won the 1962 National Championship on that very floor. I told you those facts would be in the preview. I fully expect Lance Stephenson to play. I don't know how limited he will be with his ankle injury, but the Bearcats chances of winning improve if Born Ready is in the lineup. This is an important game for both the 13-6, 4-3 Cats, and the 12-7, 3-3 Cards. Louisville has dropped their last 3 Big East games, while Cincinnati has won 2 straight. Louisville doesn't want to dip under .500 before they travel to West Virginia. Cincinnati has a chance to climb back to 2 games over .500 in conference before heading home next week to play Providence. Louisville has had the opposite problem of Cincinnati in the Big East. While UC hasn't been able to score, Louisville hasn't been able to stop anyone, giving up 85 points a game during their losing streak. Something has to give. 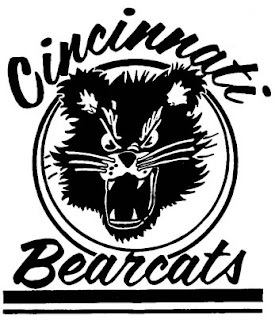 Will the Bearcats add to Louisville's misery, or will the Cards sink their claws into the Bearcats? Before we hit the numbers, check out the awesome Card Chronicle. There are more Louisville blogs listed on the right, but this is the one that I visit the most and recommend. Louisville's defense numbers look really good despite getting points put on their heads the past 3 games. The reason their SOS is lower on KemPom than other sites, is that KP has Kentucky, Villanova and Pittsburgh ranked lower than nearly everyone else. A few things to look out for before we hit my prediction. Louisville has been secretly horrible shooting 3 pointers during Big East play, only hitting 29%. That's not one of the trademarks of a Rick Pitino club. Louisville foes are hitting 42% from deep. That's bad for UC because the Cats can't make 3s, but will shoot them no matter what. The Cards offensively rebound great, but will let opponents hit the glass with regularity. The Cardinals get 46% of their misses to lead the conference, but opponents have gotten 39% of their misses. Offensive rebounding is one of the keys for Louisville. Cincinnati rebounds 75% of opponents missed shots. Cincinnati hasn't rebounded has hard offensive lately, something that has to be of some concern. Something else to watch out for are fouls. Louisville has committed the second most fouls in the BE, but has drawn the 3rd most. Samardo Samuels is great at drawing fouls, and Yancy Gates is all too willing to give them. Controlling Samuels is a big task for Gates, Steve Toyloy, Biggie McClain and Ibrahima Thomas. Gates has to stay out of foul trouble. Yancy looked like he had it going on against South Florida, but fouls plagued him. He has been getting in rhythm offensively, and against Louisville's suspect interior defense he could have a nice day. Guard play is the final thing on my list of things to watch out for. Jaquon Parker played great against South Florida, and I expect him to start and get major minutes Sunday. Louisville likes to press, so it's important for him to be careful with the ball. The Bearcats get careless at times. Louisville rotates a whole slew of guards and small forwards. Edgar Sosa and Peyton Siva love to drive. Preston Knowles is mostly a jump shooter always willing to pull the trigger. Jerry Smith was a perimeter player his first 3 years, but this year has had to drive more due to his outside shots not falling. Reginald Delk mostly stays on the perimeter. It will be interesting to see how the Cats match up with the Cards. Parker, my best friend Dion Dixon, Larry Davis, and Vaughn will have their hands full. The Cards play mostly zone, so it's important for the guards to make open shots, and get good looks. The way the offense played Wednesday night was great, more of that please. I see this game being rather tight the whole way. The Cards will probably test Lance's ankle early, and how he holds up is important. If Cincinnati can keep Louisville contained from outside and off the offensive glass, they have a good chance. If the Cats stay happy with taking 3s and can't handle the pressure, it's going to be a long day. I think whoever gets the better play out of the big men will win. I see Vaughn going for 18, Parker 8, Stephenson 12, and Gates 14, but I don't think it's going to be enough.